Page Maker Classic is our award-winning tool that allows you to create your own die-cut stickers. The stickers you create are entirely customizable giving you the option of uploading your own images, using and customizing stickers from our gallery of images, and allowing you to customize entire pages of stickers. Once you create and order a sticker page, we will print on high-quality vinyl and cut and ship it, according to your specifications. In Sticker Maker you have the opportunity to design on a blank sticker page, or choose a popular template to work with. Once you click "proceed", you'll be presented with a canvas and an artwork gallery on the left side. 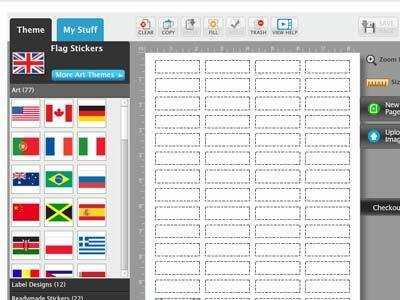 You can find more sticker artwork by pressing the "More Art Themes" button. If you wish to upload your own menu, navigate to the "My Stuff' tab and click "New Upload!" Creating a sticker page is as easy as dragging and dropping images from the artwork gallery to the canvas. Once you have your stickers on a page, you can move them around by clicking and dragging the sticker to anywhere on the page. You can resize the sticker by clicking on the sticker and then dragging on of the boxes on the corner of the sticker outline. If you wish to see the size the sticker will end up when printed, simply click the "Size" button and the approximate dimensions of your sticker will be displayed beside the sticker. You can create multiple copies of your sticker by using the "copy" and "paste" functions. Select the sticker, press "Copy", then press "Paste". You can also opt to fill the entire page with stickers by: Selecting the sticker, click "Copy", then hit the "fill" button. Clear the page by clicking the "clear" button and delete specific stickers by clicking the "trash" button.